The position of Communications & Marketing Coordinator is an exciting and essential role, charged with creatively and innovatively publicizing, promoting, and coordinating various HCEF programs (including but not limited to the Children’s Education Fund, the Holy Land Gifts Program, and the Living Stones Pilgrimage Program, and the Know Thy Heritage Program), generating awareness, sponsorship and sales, obtaining grants and raising funds. The Coordinator reports to the HCEF President/CEO in the Bethesda, MD offices. Hours may include some evenings and weekends. The following duties are intended to describe the general nature and level of work being performed, but these duties may be reasonably modified at the Foundation’s discretion. Plans and conducts various integrated projects, tasks and activities designed to increase the visibility of HCEF programs. Provides support in planning, directing, and coordinating marketing campaigns for HCEF programs. Provides leadership with respect to development of communication, and the integration of all development activities into the overall HCEF mission. Defines goals and/or required results at beginning of performance period. Communicates regularly with staff on progress toward defined goals and/or required results; provides specific feedback and initiates corrective action when defined goals and/or results are not met. Motivates staff to improve quantity and quality of work performed and provides training and development opportunities as appropriate. Recruits, trains, and maintains volunteers for the promotion of HCEF programs and the sale of products. Writes solicitation proposals, appeals, press releases and marketing materials. Assists in short-range and long-range strategic planning activities to create and implement fund raising goals and objectives. Plays active role in the identification, solicitation, cultivation, and stewardship of major donors and donor prospects, to include individuals, corporations, and foundations. Assists with the preparation of documents such as grant applications, case statements, major grant proposals, and technical reports. Establishes and maintains effective working relationships with counterparts in other organizations. Coordinates the work of staff employees and volunteers in day-to-day functional activities, as related to Communications & Marketing. May represent HCEF at business and community meetings and/or give presentations. Maintains and builds relations with media (newspapers, radio, television, etc.). Draft/recommend/review marketing contents of website. Contribute marketing content e-newsletter, weekly or as needed. Assists in developing and managing budgets for fundraising activities. Maintains database files and records, including those used to track contributions and maintains accurate mailing lists. Performs additional job-related duties as assigned. Essential Programs On these programs, the Communications & Marketing Coordinator will cooperate closely with program staff including the Children’s Education Fund Coordinator, the Living Stones Pilgrimage Coordinator, and data entry personnel. Note: For all programs, HCEF maintains thorough manuals for the optimal performance of operations. Know Thy Heritage (KTH) Leadership Program The communications & marketing coordinator is responsible for managing the KTH Program, in order to recruit applicants, identify and solicit sponsorship. The communications & marketing coordinator also assists the KTH alumni association in those endeavors as well. Prepares publicity materials, including but not limited to brochures, fliers, announcements, press releases, etc. Assists with the planning and management of events including information sessions, presentations, workshops, alumni reunions, meetings, etc. Assists with fundraising campaigns, including composing compelling letters, advisory board reports, updates, etc. Living Stones Pilgrimages (LSP) The communications and marketing coordinator is responsible an increased number of pilgrims to the Holy Land. Holy Land Gifts Program (HLG) The communications and marketing coordinator is responsible for growth in the revenues generated through sales of Holy Land Gifts. Organizes and schedules Holy Land Days in churches, working closely with local/parochial/church committees and individual volunteers. 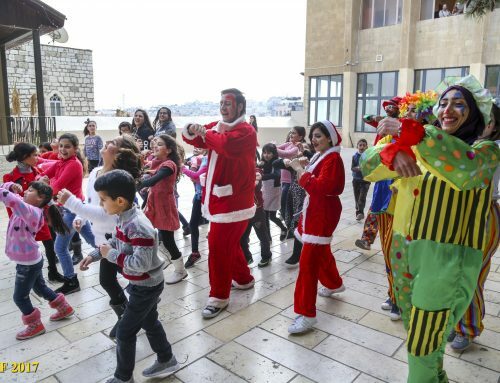 Other programs, events projects and as needed: The communications and marketing coordinator will promote additional programs and events including but not limited to the Children’s Peace Project (CPP), Bethlehem Heart of Christmas, Jesus Loves the Children, Special Events, etc. To apply, please send a copy of your resume or C.V. and a cover letter to hr@hcef.org. Promotional writing samples will also be helpful, but are not mandatory. Compelling candidates will be contacted after October 20. HCEF will continue to solicit review applications until the position has been filled.